whoever said that school years were the best of your life, probably wasn't still at school at the time. for those still in secondary education, the weekend is merely an overture to doom and gloom if you have double maths on monday morning; algebra, trigonometry and geometry are not necessarily the components of everlasting happiness. however, it may well be compulsion that takes the edge off a subject's enjoyment; in later years, items of apparent drudgery often take on a more enlightened favourability. i remained at secondary school until sixth year, prior to moving on to further education, and during that final year i elected to study for a sixth year studies certificate in english. with the constant round of educational reform, i have no idea if such a qualification still exists, but my reading of its stature at the time was somewhere due north of an 'a' level certificate. one of the compulsions directed for such study was the collected works of thomas hardy, beginning with the mayor of casterbridge and as many individual volumes as reading speed would allow. it took a mere two books to realise that the wessex tales were hewn from the same rock, and only one more to figure out that ommitting the first hundred or so pages would have little lasting effect on one's comprehension of the tale. little but scene setting and character personification inhabited these opening entreaties. at the point of end of year results, if we never saw another thomas hardy book it would have been too soon. yet only a few years into maturing adulthood (still working on it), nostalgia cast the series in a different light, and i freely commenced re-reading that which had been less than an option during compulsory education. this, you may be interested to hear, was not a phenomenon confined to english literature, for though the science of chemistry and the artistry of mathematics left me in a state of indifference and incompetence, physics i have latterly found to be of intrinsic interest, particularly as many of its facets can be easily related to daily life, something teachers of the others doubtless strove for, but ultimately failed to instil. the contents of the average higher grade physics course includes many fascinating features, many of which were of little interest to fourth or fifth year pupils at the moment of instruction. air pressure for example; i can remember being taught that, at sea level, each individual was subjected to an average of 15lbs per square inch, a not inconsiderable weight if seen in that light. i choose air pressure because i have distinct recollection of one of my peers inquiring of the teacher that, if we were able to survive downward pressure as specified above, how come we were unable to withstand something akin to a motor car resting upon our shoulders. a not unseemly question from one of the great unwashed (and uneducated) at the time, but one easily answered because that hypothetical motor car would have been in addition to those 15lbs per square inch as opposed to a replacement for. obvious now, but less so at the time; perhaps you had to be there. this is brought into focus when removing a bicycle from the bikeshed to inflate the tyres prior to another exertive training ride. 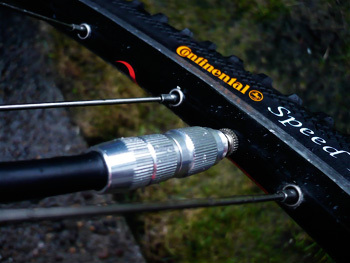 under-inflate, and the tyres will apear soft(ish) to the touch, but add the weight of a rider to that of the bicycle plus barometric pressure, and rolling resistance won't be the only thing that's compromised. appropriate tyre inflation has to overcome bike, external air pressure, rider weight, and the need for a measurable degree of unhindered forward motion. 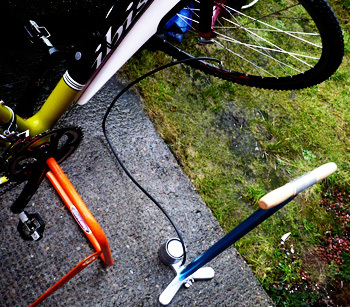 overdo it, and tyre and tube can be confined to the bin with perhaps limited hearing loss. thus, in order to comfortably meet specification, a reputable pump is required, reputable in the length and diameter of the barrel, coupled with a reasonably accurate pressure gauge. perhaps i'm the only one who reads the minimum and maximum pressures often stamped on the sidewall, but it would seem at least courteous to pay attention to the more informed directions of those responsible for manufacture. it will likely come as no real surprise that, for road bikes at least, a track pump is the most efficacious method of inflation, obviating the need to to have arms like schwarnold arzenegger, particularly if several sets of tyres need to be inflated in a short period of time. something like a lezyne alloy floor drive to be precise. visually the lezyne is a particularly attractive addition to the workshop floor, available in polished alloy, gloss red, gold or blue with a substantial carved wood handle, two lezyne embossed foot plates placed one each side of the barrel, and a rubber hose that loops over the handle and down to the chuck garage on the opposite side to the pressure gauge. but a pump of great attraction is worth few bananas if the workload is studiously avoided, or indeed, if the pump/valve interface is befuddled with intricacy. in the case of the lezyne, the reversible chuck (the bit that fits over the valve stem; in this case usable on both schrader and presta valves) is simple and stunningly effective. many comparable pumps connect to the valve by means of a plastic chuck which slips over the valve stem and is then held fast by flipping a lever to confirm engagement. these are not always as effective as they promise, and some have a tendency to loosen their grip with age and infirmity. the lezyne variation consists of a reversible chuck; unscrew from the hose connector, screw onto the valve of the day, and reconnect to the hose. since the chuck is now convincingly connected, though the pump's maximum of 15 bar (220psi) may blow the tyre and tube to smithereens, it's unlikely to lose its grip on the valve in the process. having cause to replace the easton cross wheels on the ibis hakkalugi with a pair of chris king handbuilts on pink cross hubs, now shod with a nice new pair of continental speed king mud tyres, appropriate inflation was now required. connection was easily effected, and in much the same way as being stopped for speeding (honest officer, i had no idea i was going that fast), a lowish optimum pressure was achieved almost without effort. in case of beginner's luck, it behoved me well to check the pressures on the michelins that were now to be rested. astoundingly easy, i have to say. i have found over the history of several track pumps i have owned, that their unattended stability leaves a lot to be desired. put the wheel down and step away from the pump almost always results in a vertical track pump with an overhwelming need to become horizontal. the lezyne floor drive, with its cast metal base incorporating the gauge, seems to have overcome this problem; a decently low centre of gravity. there have also been moments of consternation when the hose has struggled to reach the valve when the bicycle is on an elevated workstand. 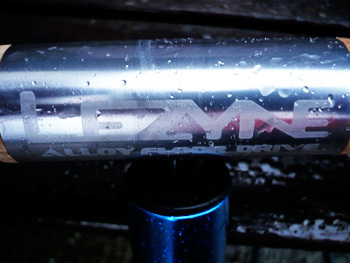 the lezyne sports 43 inches of hose which comfortably reaches a valve even if it resides at the top of the wheel's circumference at the time (for whatever reason). 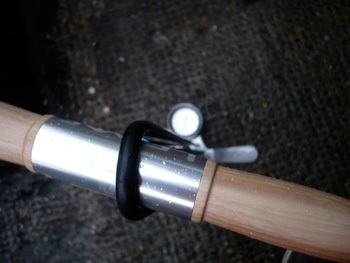 the contoured, varnished wooden handle is comfort on a stick even without gloves and in the pouring rain (needs must). though it is probably a bit saccharin and sycophantic to mention, such is the ease with which the floor drive effortlessly works, i was rummaging in thewashingmachinepost bikeshed for other tyres that might need a few extra pounds of air pressure. were i domiciled on a public thoroughfare, i would have been happy to offer such services to passers-by. i have already booked my street corner for the summer season. the lezyne floor drive retails for £59.99. 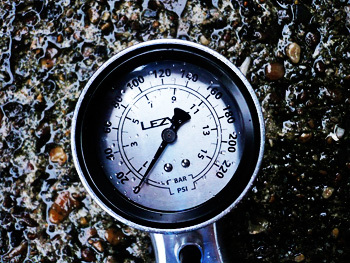 lezyne products are distributed in the uk by upgrade distribution (available via lezyne.com in the usa), the range of which, including the floor drive can be obtained from well specified local bike shops.